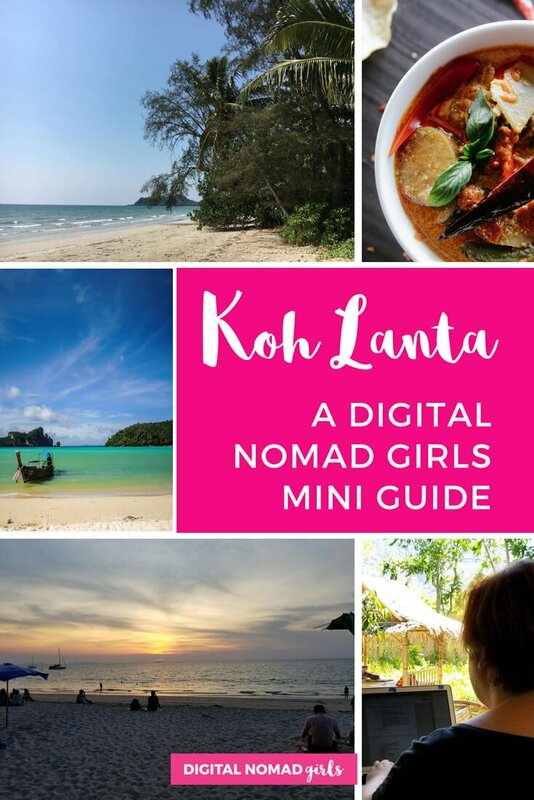 In our Digital Nomad Girls Mini Guides, we feature cool nomad destinations around the world. 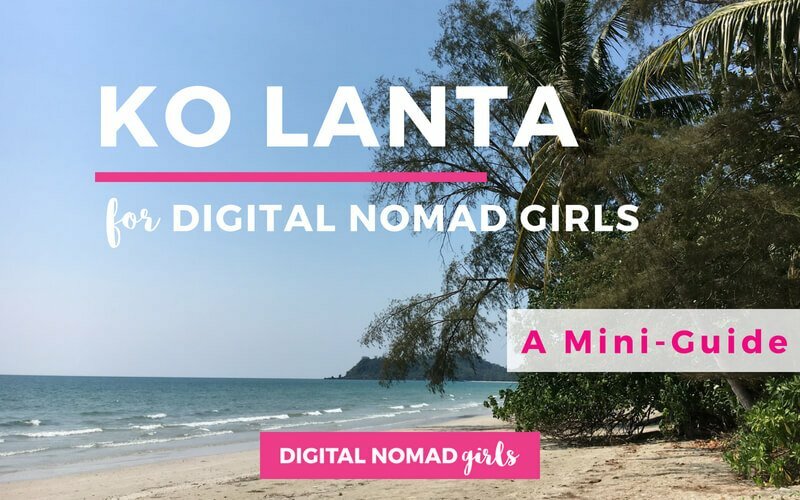 In this guide, Nicole shares her experience of travelling in Ko Lanta, Thailand in our latest Digital Nomad Girls Guide to Ko Lanta! I do writing and marketing remotely. I grew up in Boston, USA and lived in Los Angeles most recently. After three months on the road in Southeast Asia, I’m taking a breather on Cape Cod in the US. Are you from Ko Lanta or have you lived there? If yes, how long? I am not from Ko Lanta (also spelled Koh Lanta), but I stayed there recently, and received wonderful resources from the people at KoHub about how to live there long-term. What do you like best about Ko Lanta? What makes it special? The thing that makes Ko Lanta special is the community around the coworking space, KoHub. It has been called one of the best coworking spaces in the world, and it truly lives up to that name! KoHubbers have group dinners, group outings both on and off the island, and are in general a fantastic resource. The island has a great deal of natural beauty as well. What are the best neighbourhoods in Ko Lanta to check out or stay in? The majority of accommodations and swimmable beaches are located on the west side of the island. If you are working at KoHub and don’t want much of a commute, your best bet is to stay in the Long Beach area, which is the main beach with many bars, restaurants, resorts, and so forth. Klong Khong is the least developed of the “big four” beaches. It’s quite beautiful and has a number of villas to rent, as well as a lot of family-run businesses. Klong Nin is further south than Klong Khong and is also quite laid back. There’s a small town centre area and a large, pretty beach. There’s plenty of restaurants, bars and lodgings available, but it’s so spread out that you’ll never feel crowded. Old Town is on the east side of the island and was the original centre of Ko Lanta. 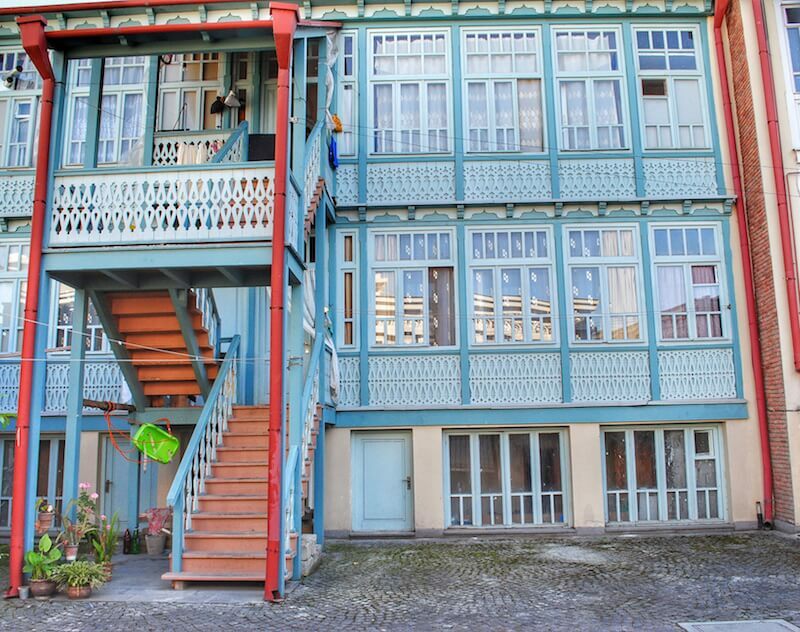 It’s maintained its character and charm, with teak houses and restaurants on stilts. It is a bit of a trek from KoHub, so prepare for a longer commute, or rent somewhere with wifi. What are your favourite places to work in Ko Lanta? Don’t believe NomadList. There’s one coworking space on the entire island, which is KoHub. It’s an amazing space to work. There’s easily seating for 100 people. They have a café where you can order everything from coffee to a coconut to full meals through their web app and have it delivered to your desk or the dining area if you need a break. They have regular outings and weekly movie nights. It has the strongest sense of community of any coworking space I’ve ever been to. If you are considering spending time in Thailand, you must spend some of it here. What are your favourite places to eat? 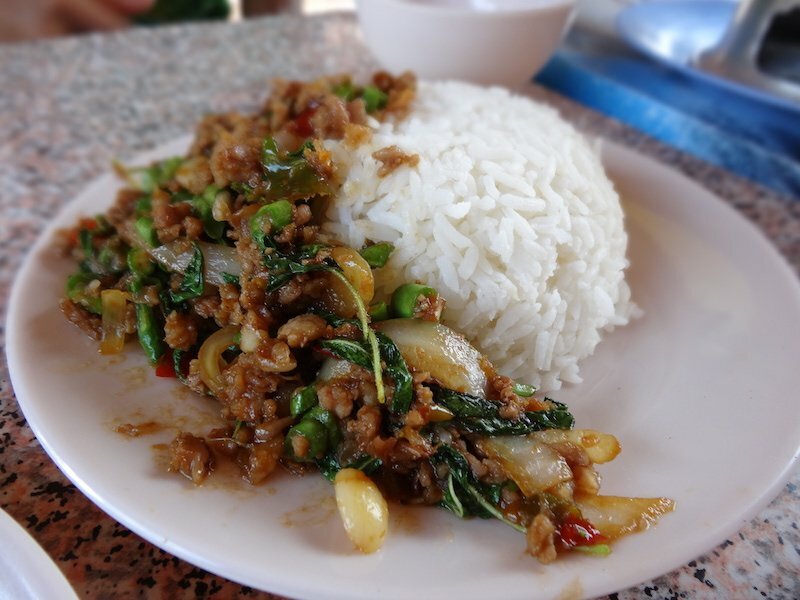 Are there any special dishes you recommend trying in Ko Lanta? Beyond KoHub, there’s a number of great places to eat on Lanta. Irie Bar has delicious Thai food, cold beer and a great vibe and caters to a number of dietary restrictions. If you want something non-Thai, Greek Taverna has all the foods you’d expect at a Greek restaurant, done exceptionally well. Fat Monkey serves great food breakfast through dinner; it’s known for having the best burgers on the island, and the pizza is brilliant too. A budget bungalow steps from the beach with air conditioning, cable TV, wifi and a refrigerator will run about $225 per week if you book through an OTA. Rent for someplace with similar amenities will run you around $175/week if you don’t look too hard, less if you do. A scooter is about $80 for a month, $30 for just one week, or $6 for one day. Fuel is about $1.25 per litre. You can have your laundry done for $1.25 per kilo. 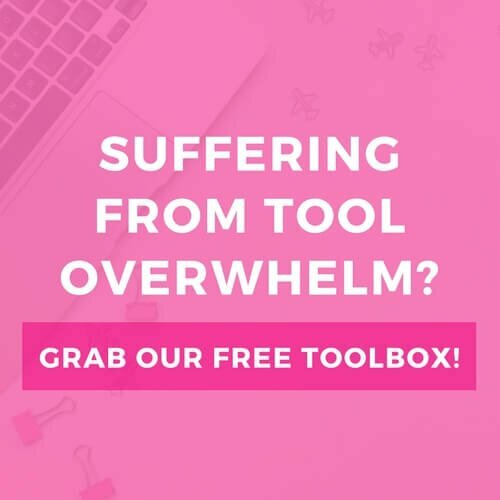 KoHub is $190 for a month, $60 for a week or $13 for one day. A cup of coffee will run you about $1.50. Meals can be anywhere from $3 for something low-end and local to $15 for something quite high end. Alcoholic drinks will run you anywhere from $3 for a cheap beer to $10 or more for cocktails. What are your favourite things to do in Ko Lanta? If you love playing in the ocean, Ko Lanta is your place! It has beautiful beaches that are relatively unpopulated and breathtaking sunsets nearly every night. Any water activity you can imagine, from paddleboarding to kayaking to sailing and more, is available somewhere on the island. Though the water on Lanta itself isn’t very clear, there are boat trips to nearby islands that are extraordinary for snorkelling. If you prefer land-based activities, you can hike to a waterfall at Mu Ko Lanta. If you’re looking for relaxation and wellness, cheap Thai massages are available everywhere, including right on the beach. Old Town is lovely for its cultural flavour. If you prefer the party scene, there are many beachside bars where you can dance until sunrise. Though I personally did not partake, “adult” milkshakes are available in many places; however please note that all drugs are illegal in Thailand. When do you think is the best time to visit Ko Lanta? Note: added by the editor as we forgot to ask Nicole this, oops! Koh Lanta basically has two main seasons: high season, which is the dry season, and the rainy season, or Green Season as the locals call it. Dry season is roughly from November to April and rainy season from May to October with September and October being the wettest months. 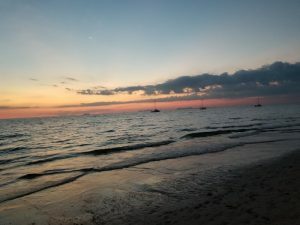 But don’t worry, you can still visit Koh Lanta during rainy season, the prices will be much lower and you’ll have the beaches almost to yourself. 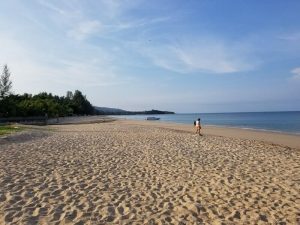 Is there a digital nomad scene in Ko Lanta? The thriving digital nomad scene on Lanta revolves around KoHub. You’ll meet people in many lines of work, all of whom are friendly and ready to talk. How would you rate Ko Lanta in terms of safety for women travellers? Koh Lanta seemed very safe for women traveling solo. I was treated with respect throughout and the many solo women I interacted with felt safe and comfortable. Common sense safety precautions are enough! There are some notes about Lanta for general safety, however. Dengue fever does happen from time to time. This is an issue throughout the beachy parts of Thailand but most tourists never hear about it unless they contract it. Make sure to wear a good bug spray if you are outdoors (I suggest something DEET-based). Thailand also is one of the most dangerous places in the world for driving. When riding on your own scooter be very careful. Wear a helmet and be aware that other drivers may be reckless or drunk. If you plan to drink, take a tuk-tuk; they’re cheap! Thank you SO much Nicole for sharing this mini guide with us! 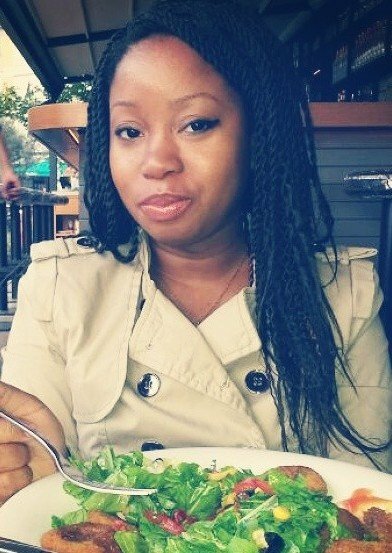 If you want to find out more about Nicole you can check out her website and connect with her on social media. 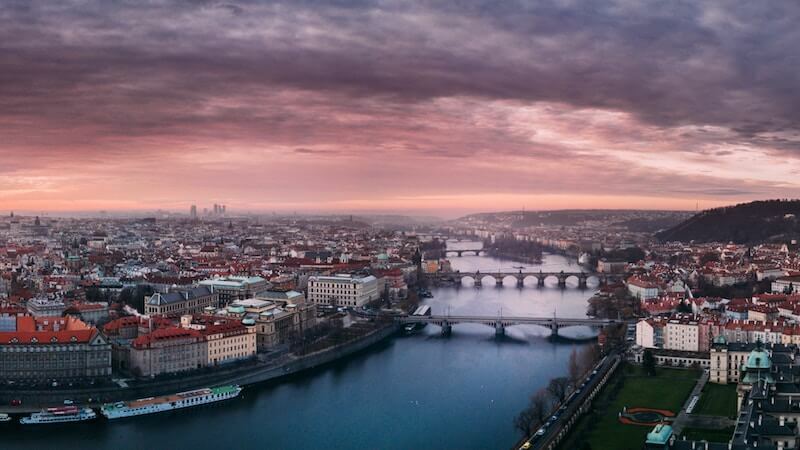 Prague is making a name for itself as a digital nomad hotspot in Europe. Find out what our DNG guest writer Kelsey had to share about this awesome city. Hi, I’m Kelsey Greene, I’m an avid traveller, creative media producer and passionate educator. I dove into the digital nomad lifestyle in 2017 by accepting a remote position for a US-based marketing company. I was born in Western, New York, and ventured beyond the state after college to live in Rhode Island, Chicago, and most recently Prague. When I’m not working, you can find me horseback riding, kayaking, baking, and of course – exploring new places! I moved to Prague in February 2018 to teach a course in media literacy at Charles University, so I have only been able to experience the city for a few months so far. What do you like best about Prague? What makes it special? Prague is a quaint little capital that will keep you continually amazed. Beyond its gorgeous gothic architecture, vivid red roofs, and bridge-adorned river, the city provides a ceaseless array of scenic parks, hidden beer gardens, and lively nightlife venues. 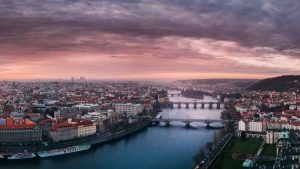 While there’s lots to do, see, and of course drink in Prague, the city is also a nice base for exploring the rest of Europe, with many affordable buses, trains, and planes providing direct routes to different destinations. 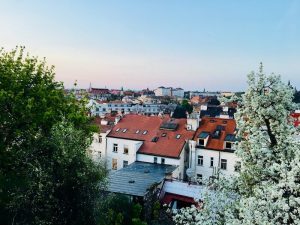 What are the best neighbourhoods in Prague to check out or stay in? This is the heart of Prague where medieval buildings, modern shopping centres, and monuments all meet. The Old Town Square hosts great markets at Christmas and Easter time. If you like to be amongst the buzz of crowds or hit up crazy clubs any night of the week, this is the place for you. This hilly district houses the Prague Castle, St. Nicholas Church, Petřín park, diverse embassies, and quaint restaurants and shops. A definite spot to visit, but more expensive to stay. An upscale neighbourhood with ornate houses, this is the where I decided to reside. I’ve enjoyed the convenient location, access to public transit, local feel and nearby parks. This is near the Vltava River, which has become the newest hotspot with boat bars and a Saturday Farmer’s Market. The hip, industrial district has some of the best art museums and the largest park, Stromovka. It’s easily accessible with public transportation, making it a viable option for accommodation. What are your favourite places to work in Prague? La Boheme Cafe – This cafe is nearby for me with friendly staff, nice decor, and good wifi. However, the internet is restricted to a time limit, which is a bit of a downer. Friends Cafe – A little, hidden gem that is widely referenced among digital nomads in the city for its strong wifi and good environment. It has a greenhouse-like hallway facing a courtyard which is so beautiful and there are also private rooms you can rent for meetings in the back. Mama Coffee – The local chain to go to for a tasty caffeine kick and multiple locations. The main hub has a second floor with big windows, which I’ve enjoyed working at. Cafedu – This spot is often referenced as a go-to for wifi with two floors and meeting rooms to rent out, but it gets very crowded with college students in the evenings and on weekends. What are your favourite places to eat? 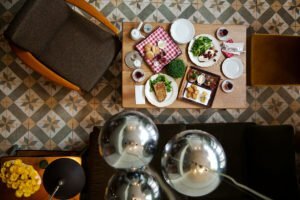 Are there any special dishes you recommend trying in Prague? Lokal is a restaurant often referenced by locals, which is intended to re-create the experience of a Communist Era Beer Hall through minimalistic design and food offerings. It serves traditional Czech food made with local ingredients at affordable prices – and the service is good, which isn’t always the case in Prague. Beyond the obvious staple of Pilsner beer, try the fried cheese, homemade sausages, or goulash with sauerkraut and dumplings. Kozlovna is a local chain of restaurants offering large, hearty Czech dishes at reasonable rates. The service is quick and usually friendly. Their beer menu is extensive and their roast duck is quite good. I have been to a few other sporadic restaurants throughout the city but often tend to buy food at the local markets or grocery stores for meal preparation. There is a rather large Vietnamese community in Prague, so there are many options for this cuisine as well. Tell us a bit about the average cost of living in Prague from your experience. Prague is cheaper than the US cities I’ve lived in. Monthly rent varies from $600 – $1,500 depending on the size of apartment and neighbourhood you choose. Public transit for three months cost me about $75. Groceries are reasonable and restaurants are inexpensive if you go to more local spots. Beer is extremely cheap, costing only $1 for a pint at the bar! Beware, you usually have to pay for water when eating out. What are your favourite things to do in Prague? Free walking tours are available for entertaining and informative overviews of the city (no reservations are required but tips are often encouraged). When do you think is the best time to visit Prague? As someone who arrived in Prague in the midst of a fiercely cold winter, I have witnessed the absolute bliss that comes with spring in this city. It seems Prague was made for this season! The pastel buildings perfectly match the budding flowers and the grass-covered hills eagerly invite everyone to stretch out across them in celebration of newfound warmth. The days can keep you guessing with quick changes in temperatures and precipitation, but the beautiful colours persist rain or shine. As long as you head out the door with an umbrella and light jacket, you should be set to go for the day. If the drizzle turns to downpour, there are many cozy cafes, restaurants and bars to duck into, which also happen to have gardens when the sun makes an appearance again. 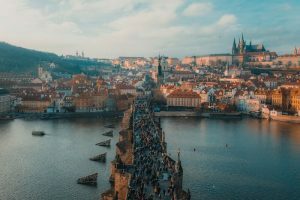 While summers in Prague are amazing as well, this is prime tourist time so expect more crowds and higher prices as the city is a rather well-known destination. I’ll note I have not witnessed fall in Prague, but based on what I’ve gathered, it seems the weather and temperatures are similar to spring. Is there a digital nomad scene in Prague? There is a rather active expat scene in Prague, which I have not been heavily involved with, but I have gone to a few Meetups and taken part in the affiliated Facebook groups. Using global female traveller Facebook groups, I’ve been able to meet up with a few international women in Prague, which I’ve really enjoyed. There’s also a Girl Gone International Group in Prague, you can find them on Facebook here. And you can find the Prague Digital Nomads Group here. How would you rate Prague in terms of safety for women travellers? Prague is very safe for women travelling solo. I have felt comfortable wandering the city alone both in daylight and at night. Sometimes locals get a bad rap for being rude, but no one is intrusive or threatening. NOTE: Of course, we always recommend using common sense as you would in any other major city in the world. Thank you SO much Kelsey for sharing this mini guide with us! 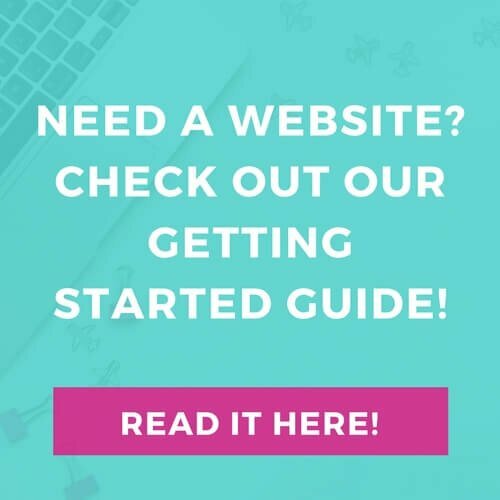 If you want to find out more about Kelsey you can check out her website and connect with her on social media. Tbilisi, the capital of Georgia, has come a long way since the Rose Revolution in 2003. Overthrowing the post-Soviet government, the country started to look up to its western neighbors. Ancient architecture, a modern cultural scene, and Georgian hospitality are what make this country unique. 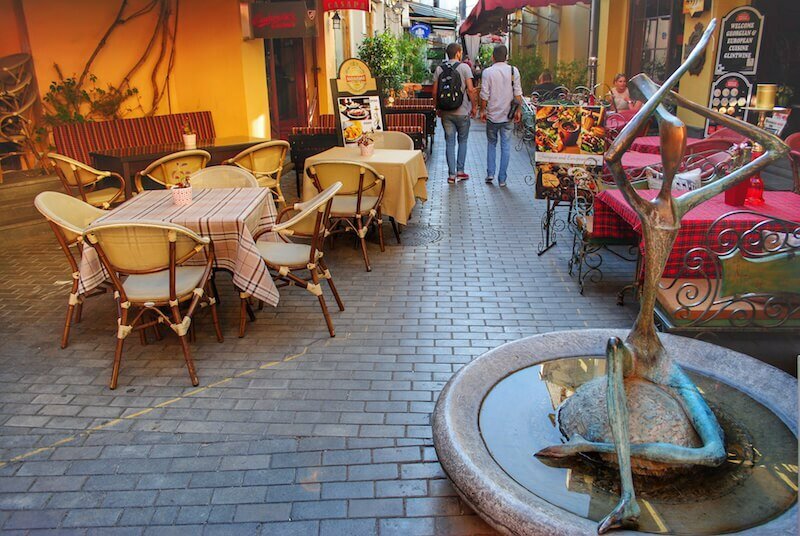 Tbilisi’s old town is full of narrow cobblestone lanes, reflecting its complicated history of Persian and Russian rule. The impact of these invasions is still visible present today, with the city featuring ornate art nouveau buildings alongside soviet modernist structures. The country is becoming a popular destination for budget and adventure travelers. You can enjoy mountains, lush nature, ski resorts, underdeveloped towns and remote villages with the highest altitude settlement in Europe. Georgia has always been a cheap destination for travelers, but the decline of the Georgian Lari against stronger currencies means that it is becoming even cheaper. At the time of writing (Feb 2017), 1 USD=2.64 GEL and 1 Euro= 2.83 GEL. The advantages of Tbilisi for digital nomads are the affordable cost of living, moderate weather (it almost never snows in the capital, and melts within a day when it does), hot summer and a beautiful old town. 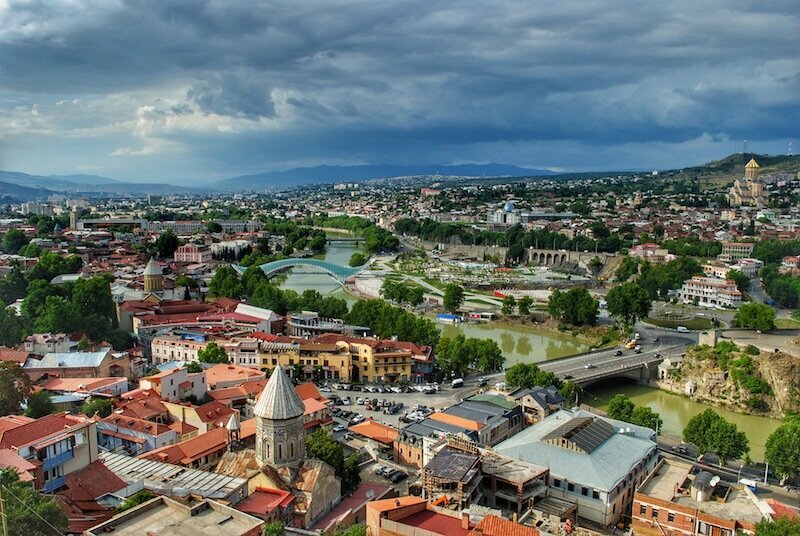 The borders with Armenia and Azerbaijan are very close to Tbilisi and, since WizzAir began offering Georgian flights, it has become extremely cheap to visit Europe from Kutaisi, the former capital and second largest city in Georgia. My favorite thing to do in Tbilisi is watch over the city from Narikala fortress at sundown. 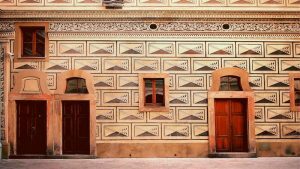 Living in Tbilisi is relatively cheap in general, but you can save even more by staying outside of the city center and living like a local. The recent devaluation of the Lari slightly raised the price of groceries, petrol, and alcohol. Yet, compared with other European or overseas cities, it is still a budget destination. Renting an entire apartment can cost from $200, depending on the district. Prices are often quoted in US dollars and tenants are asked to pay in dollars. However, you can still find owners who ask for Lari too. According to Airbnb, Tbilisi is the cheapest city for renting an entire apartment. And some of them are even quite cute. Prices start from $28 per night. The cost of food will depend on the venue and how often you eat out. However, there are relatively cheap places to eat traditional and Asian cuisine. On average a person needs around 20-25 Lari ($7-9) per meal, which might include a couple of dishes and a drink. Transportation here includes minibuses, called Marshutka, which cost 80 Tetri (29 ¢) per ride, while bus and metro rides cost 50 Tetri (18 ¢). However, if you have a MetroMoney card, you can travel by bus and metro for free for 90 minutes after buying the ticket. Paying with the card on Marshutka reduces your subsequent trips each day to 65 Tetri (24 ¢) during the day. Tbilisi does not have many coworking spaces as the concept is new here. For more European style coworking spaces, check out Impact Hub and Vere Loft. Both offer monthly memberships in different price ranges and diverse infrastructure. They are open 24/7. For more budget option, Generator 9.8 offers FREE working space. However, the time is limited to 10am to 7pm Monday to Saturday. In the evening, Generator 9.8 becomes an overcrowded bar full of young locals. Cafés and restaurants have good internet speeds most of the time. 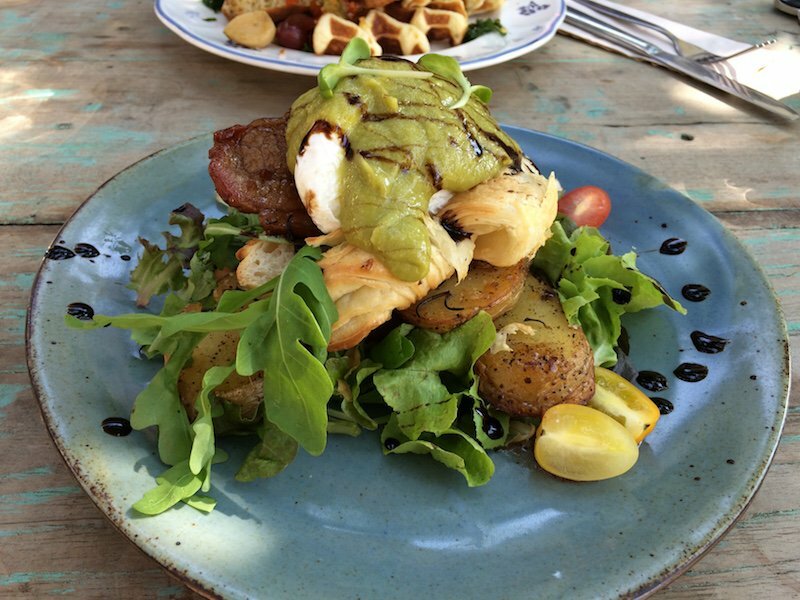 Try New Mziuri café or coffee shops like Entrée or Coffeesta. Moreover, the city has its own free WiFi, called Tbilisi Loves You. It is available in most districts and areas. The connection is not always super-fast, but it lets you catch up with friends on Facebook and Instagram, reply to emails or search for a spot on the go. 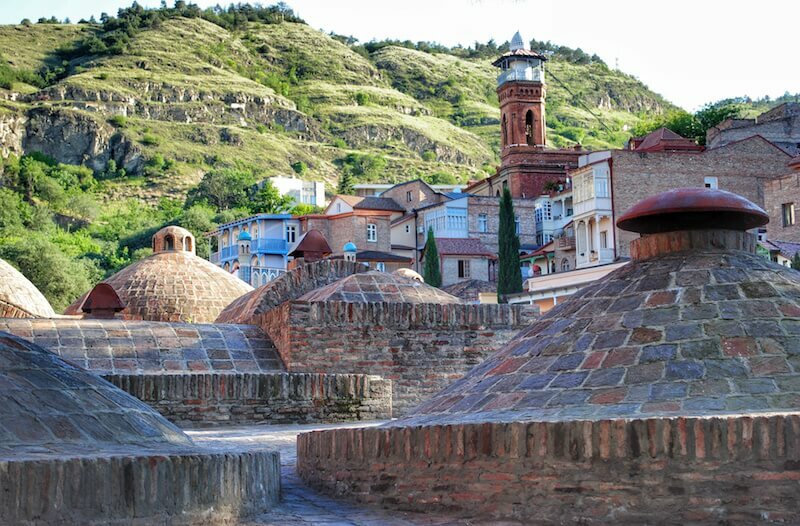 One of the must-see sights in Tbilisi is its Old Town. Featuring Narikala fortress, sulfur baths and cobblestone narrow lanes leading to traditional brick houses with carved wooden balconies, the old town is a marvelous experience. 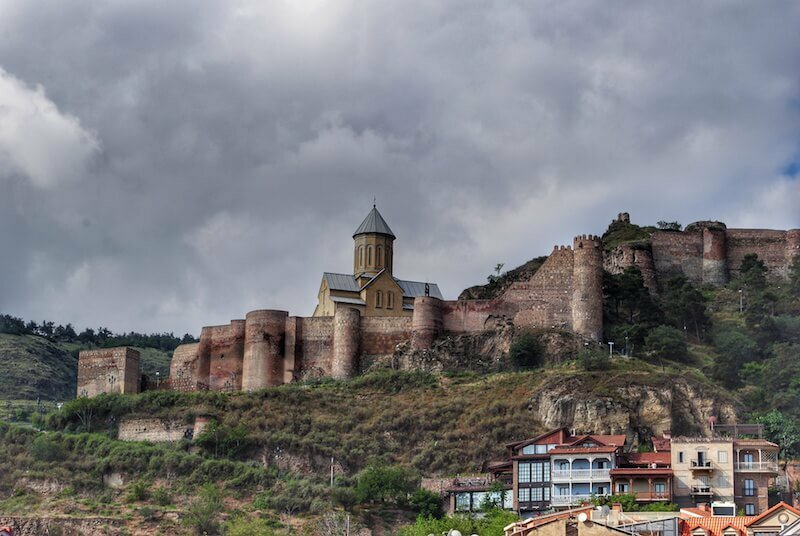 Narikala, located on the hill overlooking the city is an ancient symbol of Tbilisi. Constructed in the 4th century, it was once known as Invidious Fort. Locals believe that the name comes from a Persian word for the citadel, but another theory notes that in Mongolian it meant “little fortress”. Directly below Narikala hill lies Abanotubani, a district with public bathhouses of natural sulfurous water. This is the area where, according to legend, King Vakhtang Gorgasali’s falcon fell. This was when he discovered hot springs and founded a new capital. Tbilisi is the combination of two words, and means “warm waters”. From here, you can stroll towards Shareni, Mambis Rigi or Rkinis Rigi streets. These pedestrian-only areas are full of cafés, bars and clubs. Another absolute must-visit is Tbilisi’s new landmark, the Tower Clock. 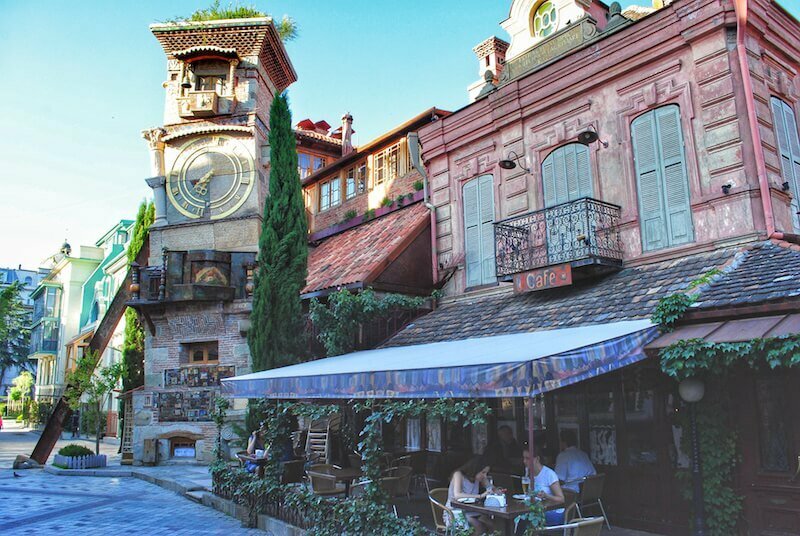 Every hour an angel rings the bell with a hammer, but if you’re there at noon or 7 pm, you’ll see a small puppet theater show “The Circle of Life”. Tower Clock also has a unique exterior that features hundreds of handmade tiles. Generally, feasts are an important custom here. Each region has its own individual meals and culinary traditions. Therefore, the cuisine here is very diverse and authentic. You should know that Georgian meals are heavy in dough, meat, and walnuts. The cuisine suits both meat lovers and vegetarians. It goes without saying that eating a meal in the region it was originally developed is better. But don’t worry! Some places in Tbilisi still offer these authentic meals. 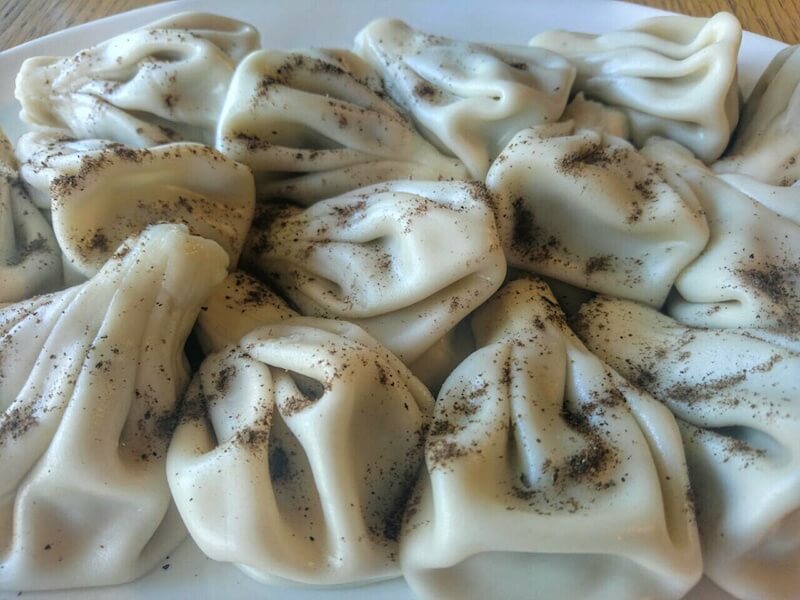 The number one meal favored by locals and foreigners is Khinkali, a type of meat dumpling. Khinkali have to be eaten in the right way; it has a broth inside, so you should avoid spilling this on your plate while eating. This needs a bit of practice, but you’ll get there. Vegetarians can enjoy mushroom or potato Khinkali. Foreigners visiting Georgia are keen on vegetables in walnut sauce, and especially eggplant. For locals, walnuts play a vital role in the cuisine and can be found in almost anything, even desserts. Spinach, bell pepper, cabbage and eggplant seasoned with walnut sauce are an essential part of Georgian cuisine and feasts. It’s found on literally every dinner table. Usually, they are prepared and served separately, but some restaurants serve them as a mixture. 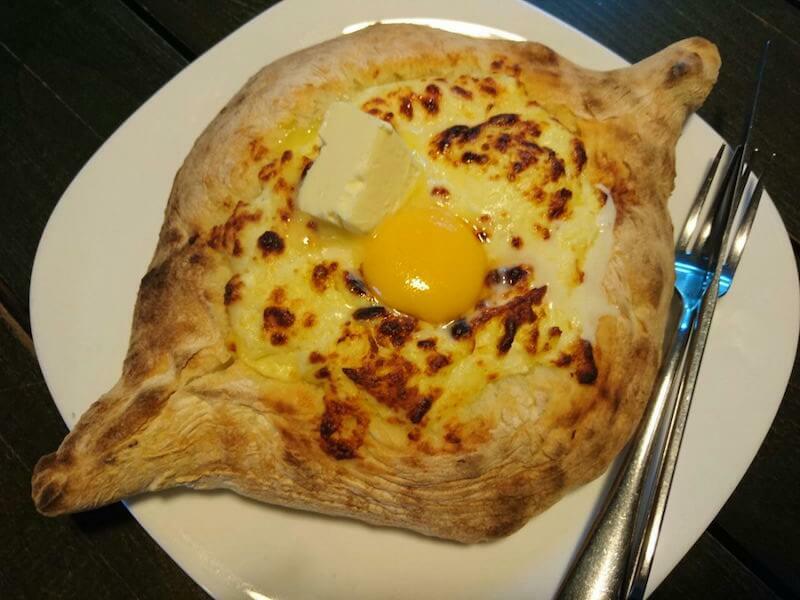 Another all-time favorite is Khachapuri, a pizza-like meal full of mozzarella-like cheese. The variety changes from region to region, with one of the most distinguished from the Adjara region. Often called a “cheese boat” by visitors, the meal is unique in its shape and preparation method. After baking in a brick oven, a raw egg is cracked on top, together with a knob of butter. Like Khinkali, this meal also has its own eating method. The insides should be mixed together and bread should be dipped in the cheese. Lastly, you should definitely try the candle-shaped Georgian snack/dessert, Churchkhela. Made of grape juice and nuts, it is a very common dessert served during Christmas in Georgia. If you plan on staying in Tbilisi for a while, you might want to get a SIM card to get a great mobile connection or call befriended locals. Magti GSM provides a great internet connection, while Geocell has better call and SMS packages. Prospero’s Books & Caliban’s Coffeehouse and Biblus Gallery offer a wide selection of English books. To see what events, exhibitions, and festivals are happening in the capital, check out Tbilisi Life. 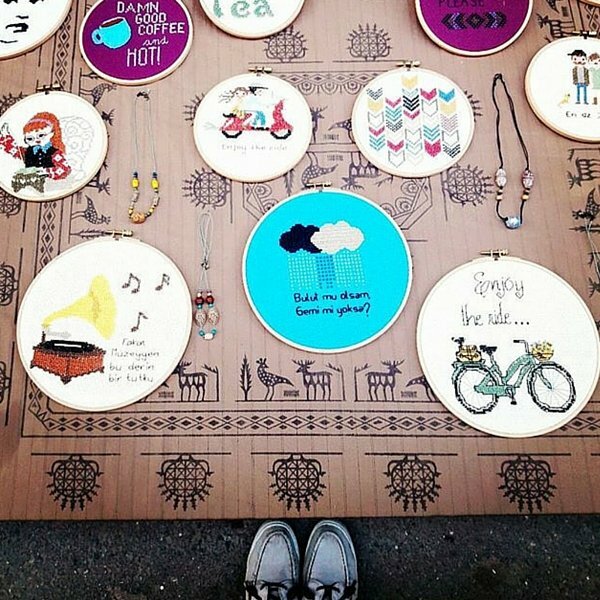 Depending on the season, Tbilisi hosts a flea market in various locations. Here you can find used clothes, handmade accessories, paintings and much more. Another event to consider visiting is a Startup Market, which helps start-up businesses to attract visitors and customers. 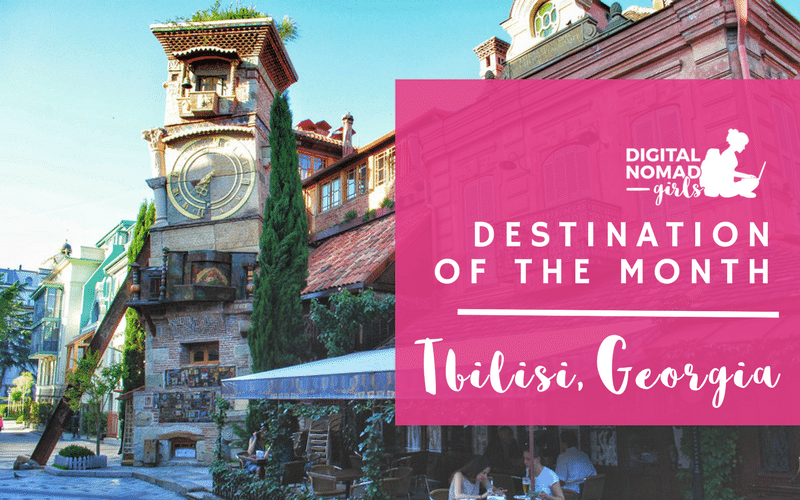 Tbilisi is a great up and coming destination for Digital Nomads. Have you visited or are you planning to? Please share in the comments below! In our Digital Nomad Girls Ultimate Guide series, we introduce cities from around the world that are great places for location independent ladies. From Chiang Mai to Medellin, we’ve got you covered. 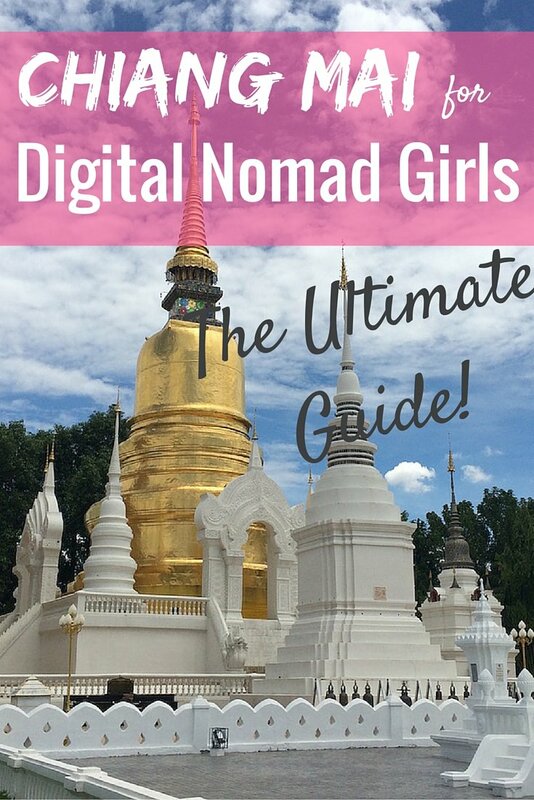 The first edition is Chiang Mai for Digital Nomad Girls. It feels almost like a cliche to write about Chiang Mai as a nomad hotspot. 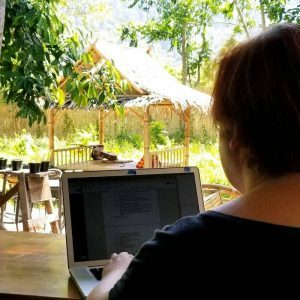 After all, the Thai mountain town has become digital nomad central in recent years. But that’s for good reason. Affordability, warm weather year-round, delicious and varied food, friendly locals and a great community make Chiang Mai the perfect spot to settle down for a while and get some work done. Whether you’re starting out or already a seasoned remote worker, Chiang Mai is not to be missed. Chiang Mai is the capital city of a Northern Thai province of the same name. It’s located in the mountains, only a few hours from Laotian and Burmese borders. Known for its great and varied food, cheap living costs, friendly people and fast wifi. That’s why it’s become a nomad hotspot year-round. The most popular time to visit Chiang Mai is from around October to late January, when the weather is more mild and dry. 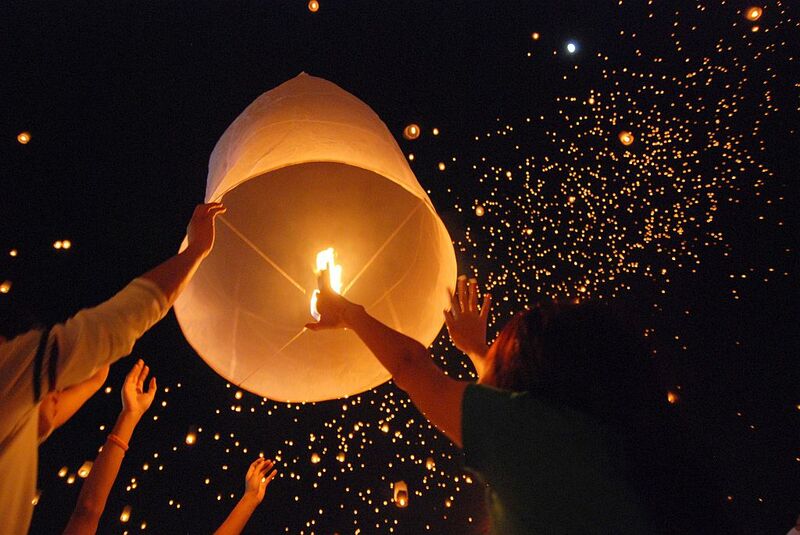 The worst time to go to Chiang Mai is during burning season, which lasts from February to April every year. Farmers around the city burn off their fields and the resulting air pollution becomes almost unbearable. Most expats, nomads and many locals leave during this period, moving to the Southern islands for a few months instead. Although a little cooler than its bigger brother, Bangkok, Chiang Mai can still get very hot year round with its tropical wet and dry climate. The coolest time is October to mid-February, although it never really feels cool unless you’re riding on a scooter at night. (lows around 15 C, highs around 30 C). The hottest season, coinciding with burning season, is mid-February to June, when humidity is high and temperatures reach lows of 24 C and highs of 36 C.
June to October is wet season, when the old town has been known to flood. 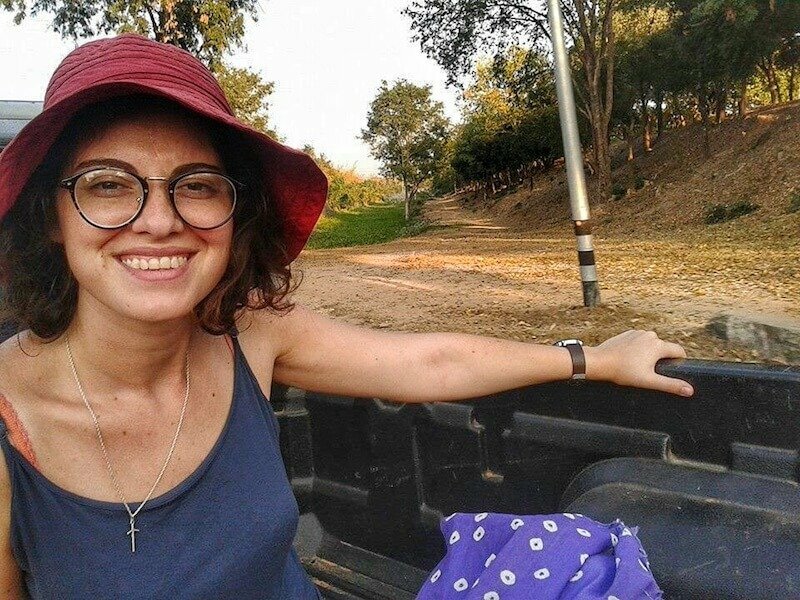 In general, safety is not a big issue in Chiang Mai, but travellers should always use common sense that you would at home. Many Thai women dress in a very modern style, often wearing shorts and summer dresses. However, make sure you dress respectfully, especially when visiting temples. When driving on a scooter make sure you always wear a helmet, preferably a proper motorbike helmet. Random police checks of scooter drivers are quite common, with the policemen often giving out fines of 400-500 baht. In general, you should always go to the police station to pay the fine, but it’s usually less hassle to just pay the policeman there and then (albeit, not strictly legal). Public drinking is not allowed in Thailand. For minor issues or check-ups, Chiang Mai’s hospitals are very well equipped. In case of emergency, you might have to be transferred to Bangkok, which has some of the best hospitals in South East Asia. Chiang Mai Ram Hospital is located in the North-West of the old town, near Nimman and offers some of the best services. It is, however, a private hospital, and not all insurance will cover your treatment if you could have visited a public hospital instead. So, you should check with your insurance first to find out if they’ll cover your treatment there. Dental care and other check-ups can be very affordable in Thailand, and many foreigners visit doctors there beacuse it’s cheaper than at home. You can find an overview of healthcare in Chiang Mai here. The Bangkok hospital (in Chiang Mai) offers a Women’s Health Clinic. Visas are one of the hottest topics when it comes to Chiang Mai. The paperwork you require absolutely depends on your nationality and how long you want to stay for. Please check your country’s visa regulations for Thailand before making any travel arrangements. In general, most nationalities (with exceptions) can enter Thailand with a visa exemption. This is not technically the same as a visa-on-arrival, but works much the same way. The exemption allows you to stay for 30 days, after which many nationalities can apply for a 30-day extension. Last time we checked, the extension cost 1900 baht (around $53) and can be applied for at any immigration office in Thailand. If you want to stay longer you can apply for a tourist visa in your home country or in a few other countries in Southeast Asia. The visa situation is constantly changing, that’s why we urge you to always contact your consulate or embassy for up-to-date information. At the time of writing, there were two types of tourist visa available: the single-entry 90-day visa (which lasts 2 months but can be extended for an extra month, see above) and the 6-month multiple-entry visa, which you must apply for in your home country. While the 6-month multiple-entry visa sounds great in theory, you may have to prove that you have at least $7000 in your bank account, which may not be possible for every aspiring digital nomad. Chiang Mai’s affordability is one of the main reasons it has become the most popular nomad destination in the world. Depending on your standards, you will be able to live comfortably for around $600 a month. This would include a simple studio apartment, access to a coworking space, scooter rental, eating mainly cheap street food or in food courts, and the occasional night out. A street food or local market meal will set you back 30-50 baht, local meals in little cafes or shacks will cost 40-100 baht. Western meals can have Western prices, with a nice brunch costing around 120-300 baht. In general, food is fresh, delicious, and very cheap, and if you’re on a strict budget you can easily eat well for 100 baht a day. Room and apartment prices are changing rapidly, but a basic studio apartment with aircon, pool access and a balcony can be found for as little as $150 per month (without bills). Some of the flashier, luxury condos can go for almost Western prices, that’s why we’d suggest talking to people when you arrive to find out where to get a good deal. Most places make you sign a one-month contract and pay a 1-month deposit that you get back at the end. Many Asian budget airlines like Air Asia fly directly to Chiang Mai airport, which is located only 3 km south west of the city. Most people arrive in Bangkok and either take a short 1-hour flight or the cheaper overnight train to Chiang Mai. When you arrive at the airport you can either take a taxi, songtheaw or tuk-tuk. Taxis are surprisingly affordable and usually cheaper than tuk-tuks. 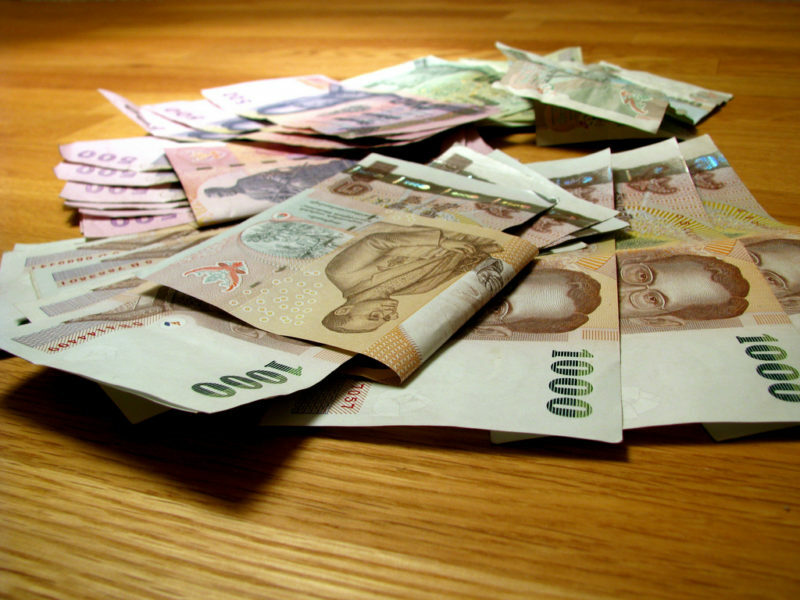 A taxi to the Nimman area will cost anywhere from 100 to 200 baht, depending on your haggling skills. 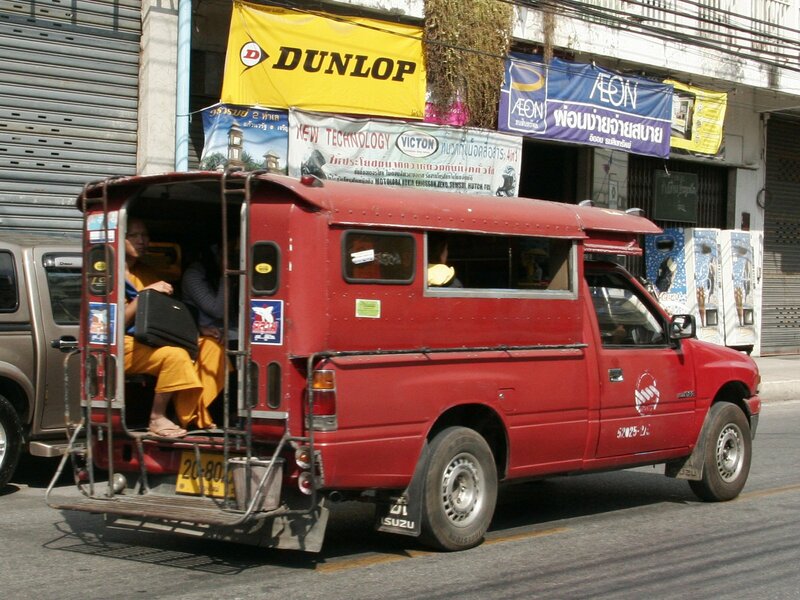 Songtheaws (or red trucks) are the cheapest option to get around town and usually cost 20 baht per ride within the city. From the airport they might charge around 40-50 baht, which is still a steal. The trick to riding in red trucks without being ripped off is not to ask about the price when you get in. As soon as you ask how much the ride costs, the driver knows you’re new to Chiang Mai and might try to charge you an inflated price. If you just get in, they will know that you’ve taken a truck before and know that the standard price for a ride in the city is 20 baht. Obviously, this price doesn’t apply late at night, when fares often double, or if taking a longer trip. Renting a scooter is also very popular and gives you total flexibility. Scooters can be rented for around $60-100 per month. You will need to pay a deposit, but avoid leaving your passport as a deposit, even if they insist on it, a cash deposit is always best. ALWAYS wear a helmet (a proper helmet is best, unlike the little “soup bowls” most people in Thailand seem to wear) and we wouldn’t recommend driving a scooter if you don’t have any experience. 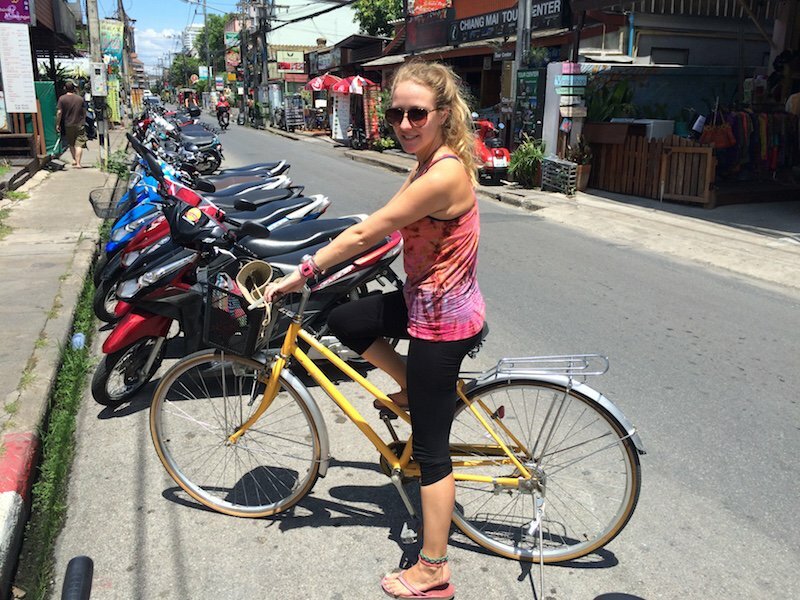 Renting a bicycle can also be a great way to explore Chiang Mai, but be sure to ride carefully on the main roads. Most guesthouses and many other shops rent out bicycles per day, week or month. You can try to haggle, but most pay around 60-100 baht per day, or around 300-500 baht per week for a simple push bike. Bicycle helmets are virtually impossible to find to rent, but you can buy a cheap helmet at one of the many helmet shops along the moat. Chiang Mai has a whole range of options for digital nomad girls who’d like to stay for a while. The easiest and most flexible way to find a place is to just show up. Book 3 nights in a hostel, hotel or AirBnB (or couch surf) and then walk around different neighbourhoods to get a feel for the town. You can walk into any of the apartment building and ask if they have availability. It’s always worth haggling, especially in low season. Chiang Mai’s old town is basically a mile-wide square surrounded by a moat and some partially intact old town walls. Mountains lie to the west and the trendy Nimmanhaemin (or Nimman) area lies to the northwest of town. Each side of the square has a gate, which provide popular meeting places and host food markets in the evenings. Most tourists stay inside the old town, but most of the apartment buildings for longer stays lie in the outer areas, mainly along Nimmanhaemin Road or East of the old town. Nimman is by far the most popular area for digital nomads. Many coworking spaces and cafes can be found here, making it a popular area with local students as well. Staying in Nimman can be a lot of fun as there’s always something going on. There’s an incredible selection of restaurants and street food, and even two full-sized shopping malls with food courts, cinemas and shops. If you’re planning on staying more than 6 months you can also find long-term homes through perfect homes. Find more Chiang Mai hotels here. The rent will completely depend on how much you are willing or able to spend. A nice 1-bedroom AirBnB apartment can cost $500 a month. A cheap local studio without aircon can be found for $100 a month. Most expats stay in condos and studios. Baan Thai is very popular and costs around $150 per month, although wifi and electricity bills are extra, which can easily double the price per month. Many places also rent scooters and often provide competitive deals if you’re staying there. Are there any coliving places yet? Many nomads share houses as it’s affordable and a fun way to meet people. The first coliving space in Chiang Mai, Power Coliving, has just opened. For $999 per month you get a room, scooter, cleaner, snacks, events and more. Although definitely not the cheapest option, its an easy way to settle in if money is not an issue. Chiang Mai certainly doesn’t have a shortage of coworking spaces and cafes. Most cafes are equipped with wifi and don’t usually mind you working there for hours on end as long as you buy at least a drink. Students often work in cafes, so it is not unusual to see whole groups of young students revising until late at night. There are so many cafes with wifi in Chiang Mai, you could work at a different one every day and not repeat yourself for months. You can find a great overview at Chiang Mai Coffee Culture. Wawee Coffee is a chain with many branches in Chiang Mai. Their iced chocolate is great and costs around 75 baht. Their wifi is fast and AIS Super wifi is available. Socket availability depends on the branch, but is not usually a problem. Into the Woods is a fairytale themed cafe near the North Gate that’s surprisingly affordable and definitely worth a visit. Wifi can be a little hit and miss sometimes. Wake-Up Cafe on Nimman is open 24 hours and has great coffee and cocoa. The also have cute seating pods and swing chairs. Punspace Nimman is one of the most popular spaces and can get quite busy at times. Their wifi is great, and they are open 24 hour, offering free coffee, water and biscuits. Punspace Tha Pae Gate is a second Punspace location providing much the same service at a bigger location east of town. CAMP is a huge working space/cafe on top of Maya Mall in Nimman. It is very popular with students and remote workers, so make sure you get there early to get a spot. The wifi is very fast if you have access to the AIS super wifi (free when buying a compatible AIS sim card and topping up with a few dollars). Addicted to Work is located near Maya mall and is a cosy space with flexible payment options. Mana is tucked away on a little side street in Nimman and has reasonable daily and weekly passes that include drinks. Starwork is relatively new and is located in the Northeast of the city, near Central Festival Mall. If you want more in-depth info, here’s a great guide. Chiang Mai is every foodie’s dream. Local markets, cheap street food, Western restaurants, hipster cafes – there’s something for everyone. The South Gate and North Gate markets are open daily from around 4 pm and have a great selection of food and drinks. Fresh fruit shakes start at 25 baht – they are so good you sometimes need two. The best shakes in town can be found at Ms, Pa’s stand at the South Gate market, she is almost a celebrity in Chiang Mai. Chiang Mai offers many excellent vegetarian and vegan options including Morning Glory, Anchan, Taste from Heaven, Imm Aim and Free Bird Cafe. 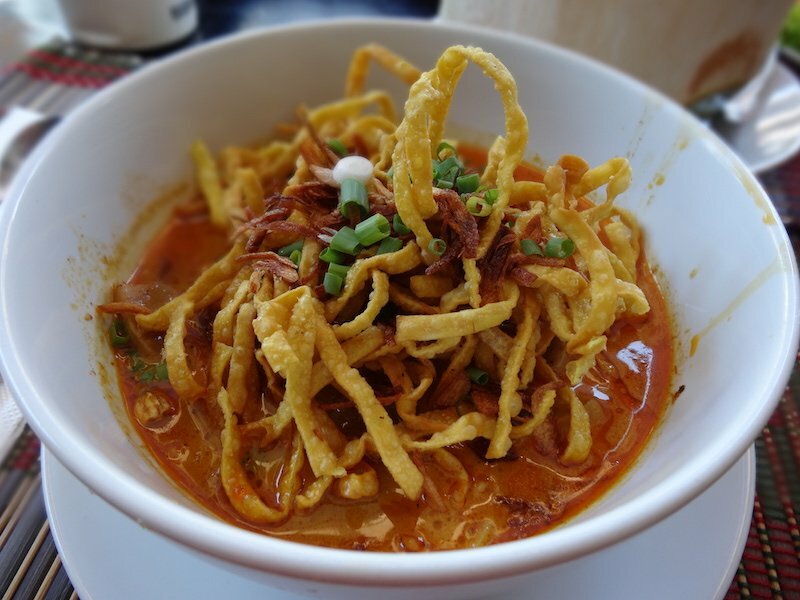 The most famous Northern Thai dish is Khao Soi, a thick, yellow curry noodle soup with fried egg noodles on top. It usually contains chicken, but most places also have a veggie version. It’s always served with lime, onions and pickles, and can be pretty hot, but it is so verrrrrrry tasty. 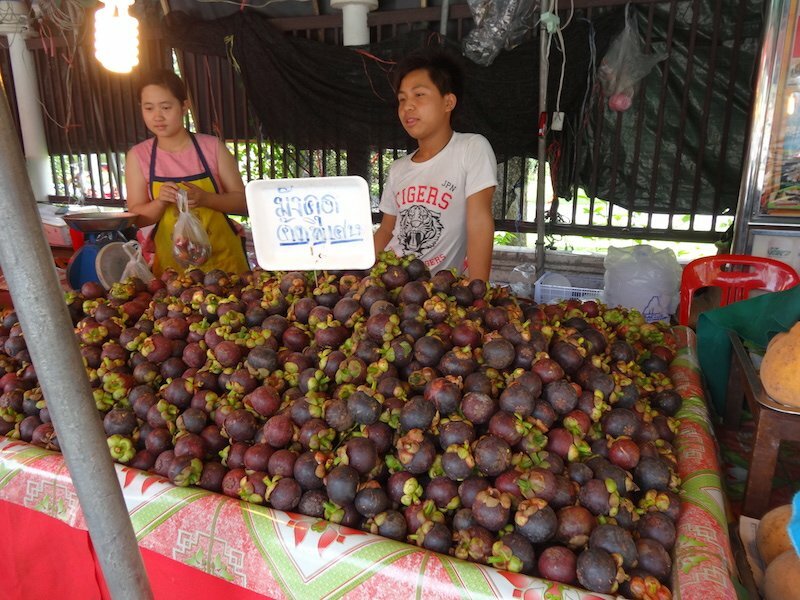 For fruit lovers, Chiang Mai is like heaven. 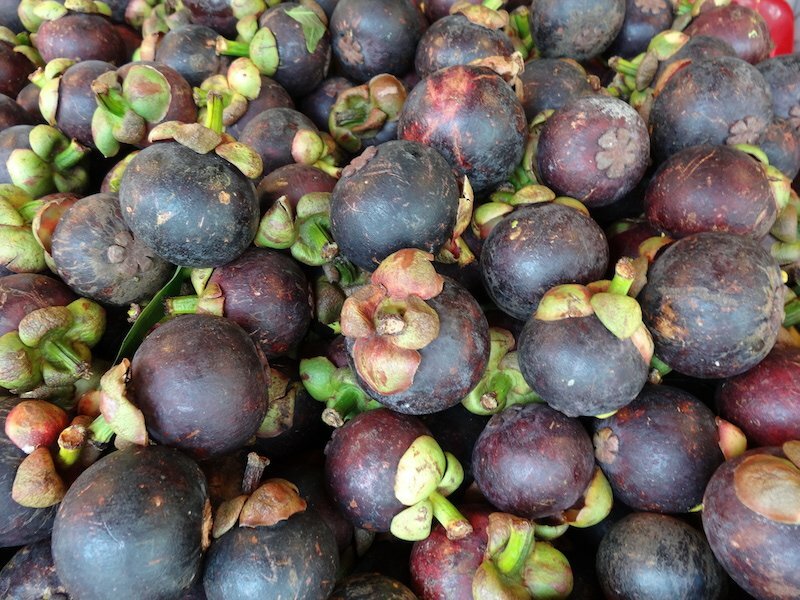 You can find an array of tropical fruits for just a few dollars per kilo. 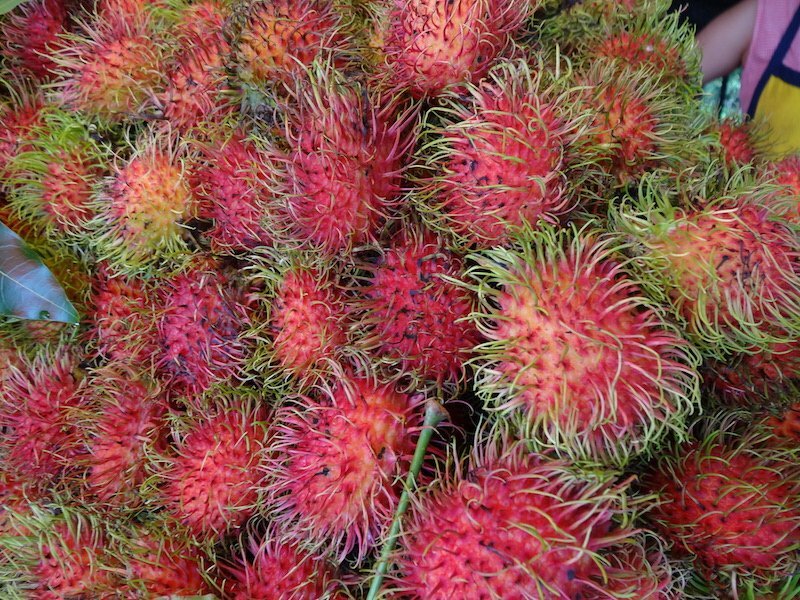 Try mangosteen, rambutan, lychee, mangoes, papayas, snake fruit and, well, everything else really. 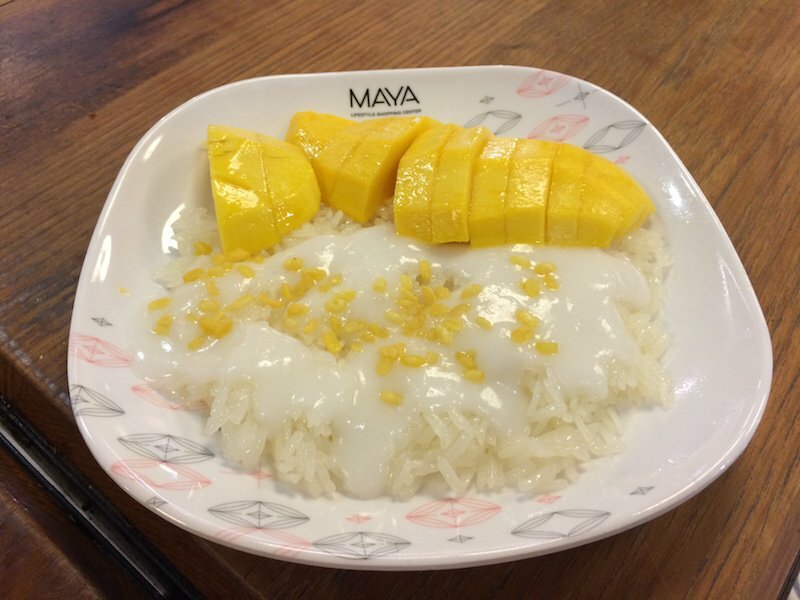 Also, don’t forget to try mango sticky rice! You’ll know why once you’ve tried it. Thai food is diverse, flavourful and fresh. You can find excellent food on literally every corner. Don’t be afraid to try the street food, just make sure you order from a popular place. The markets are perfect for trying out different dishes, but many of the street shacks dotted around town are worth a look. The Burmese Place located near Anchan is very popular, incredibly cheap and offers Thai food as well as Burmese fare. The food court in the basement of Maya mall has a great selection of different food stands. Ongtong Noodle: located just down the road from Punspace Nimman, this is a great lunch option. Their Khao Soi is amazing, as is the butterfly pea flower juice. Dukes: a proper American restaurant with a huge menu and huge portions. It can be a fun place to celebrate Christmas or Thanksgiving. They have multiple branches around town. Butter is Better: a diner in the south of the city, known for its delicious breakfasts and great mac and cheese. Rustic and Blue: cute hipster cafe in Nimman that has lovely breakfasts and lunches. Their coffees are also excellent. Smoothie Blues: great western breakfasts and lovely smoothies. The bagel is a very affordable option. 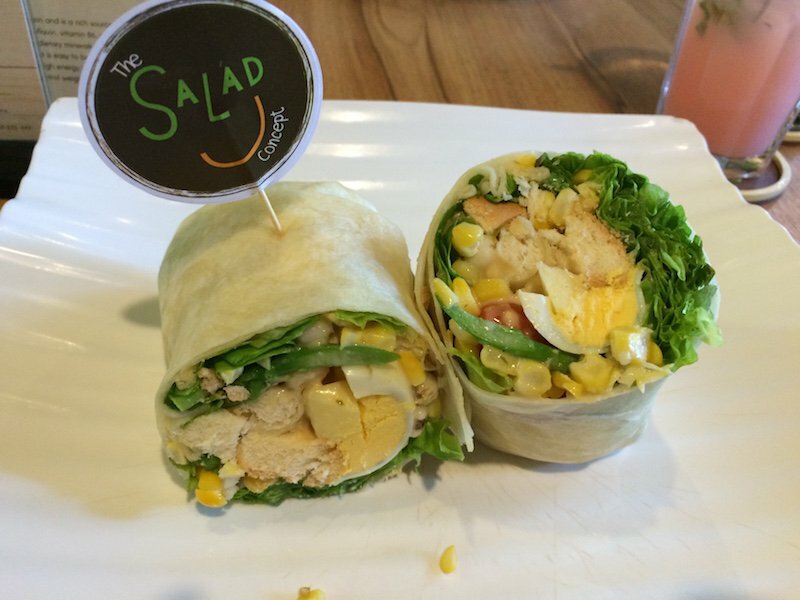 Salad Concept: a popular place that offers (yes, you guessed right) salads and wraps. You can build your own or pick from the menu. 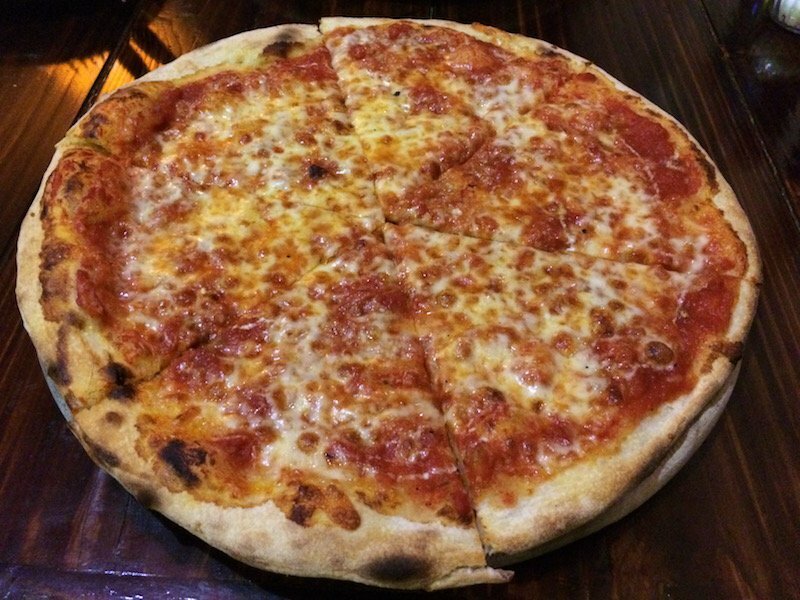 Croco Pizza: weird name, great pizza. 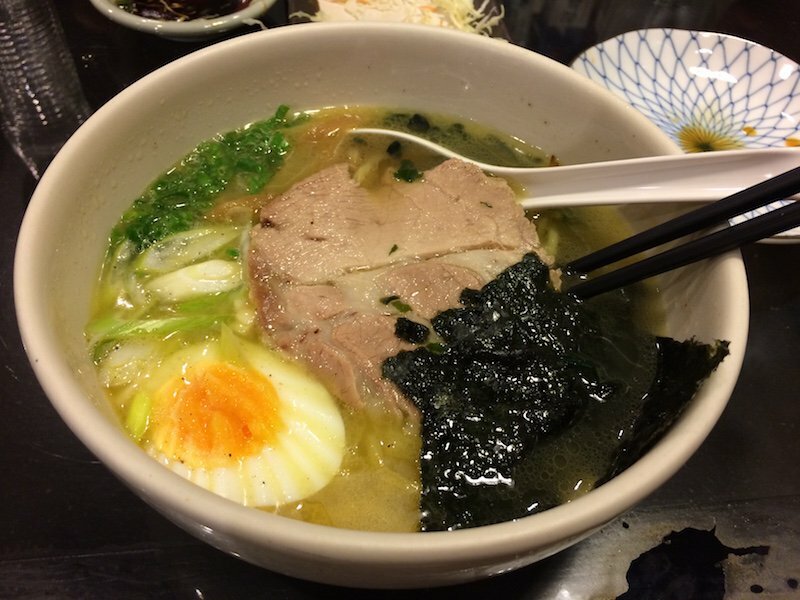 Ninja Ramen: out of this world butter salt ramen and other Japanese dishes. Taiwan Restaurant: a simple little place that makes incredible Chinese dumplings. Hong Kong Lucky Cafe: excellent noodle and soup dishes. Kabab House Indian Food: delicious Indian food and great lassis in the old town. Doesn’t look like much from the outside, but it’s friendly, tasty and affordable. 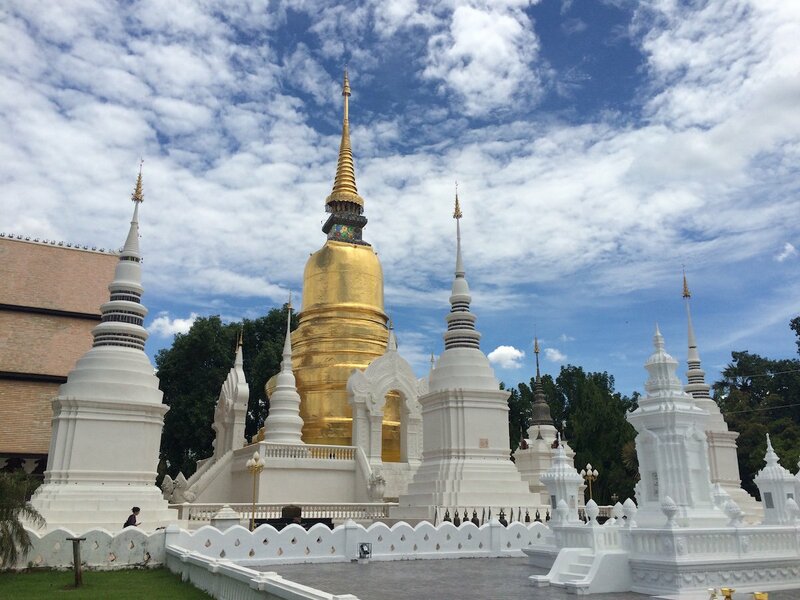 Chiang Mai is home to over 300 temples! They vary in size and style, but are all free to visit. Please dress appropriately by covering your legs and shoulder. Traditional Thai massages are a definite must-try during any visit to Chiang Mai, you can find information on different types of spas here. The most famous massage can be found at Lila’s, and is performed by former female prisoners. It’s a great experience and you support a great cause. One of our favourite things to do is watch a real Muay Thai fight in the Tha Phae Gate arena. Tickets start around 400 baht, and you get to see around 6 fights in different weight classes. It might sound weird, but it’s a really fun way to spend an evening with friends. 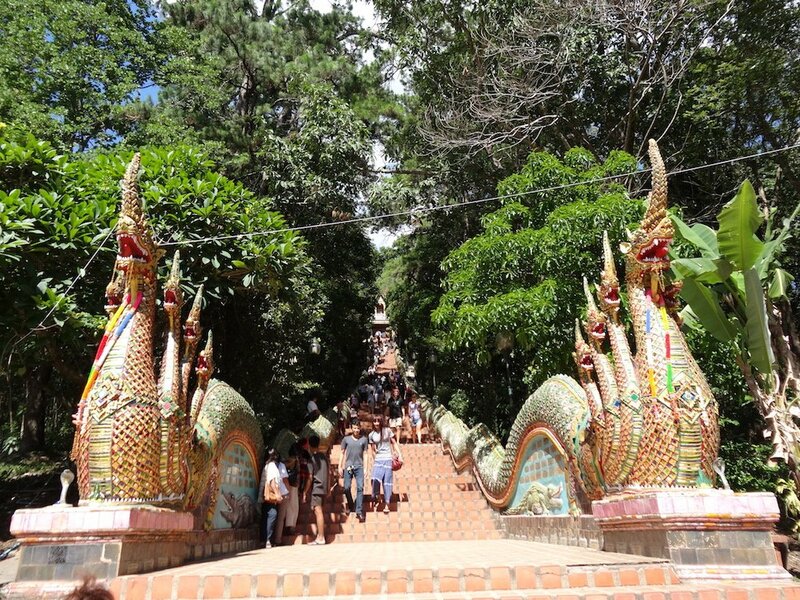 A visit to Doi Suthep temple on top of the mountain is a must. Please wear a helmet if you’re driving there on a scooter. Sticky Waterfalls is a popular destination about one hour outside the city by Songtheaw. The rocks on the waterfall are very porous and so algae don’t stick to them, resulting in a very rough surface that isn’t slippery at all, meaning you can climb all the way to the top. The Grand Canyon is another popular day trip and a great option if you want to go for a swim. Around half an hour from the city by red truck and entry is only around 30 baht. 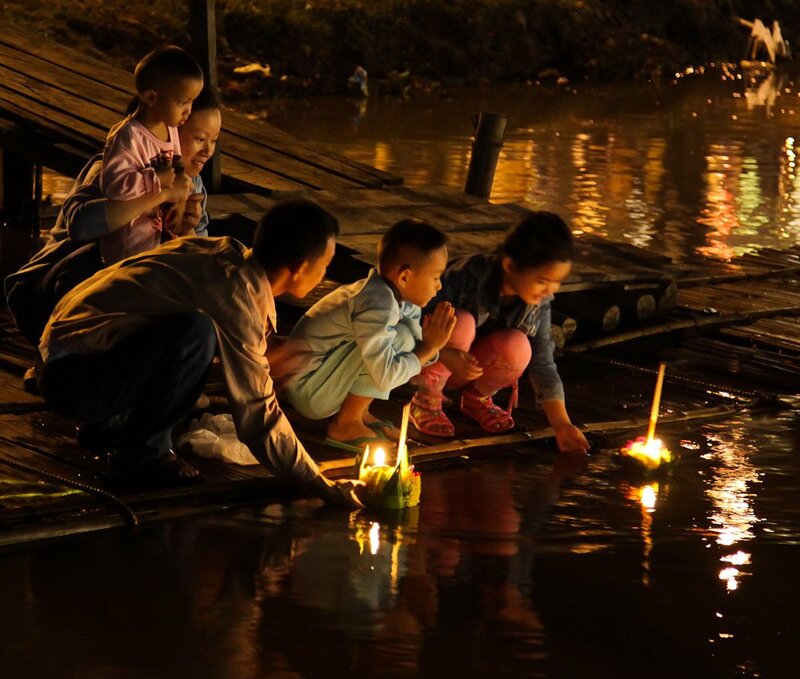 The world famous Loi Krathong and Ye Ping festivals are celebrated on the last night of the twelfth full moon every year, usually in November. If you like colourful lanterns and fireworks you should make sure to visit before or during the festival. 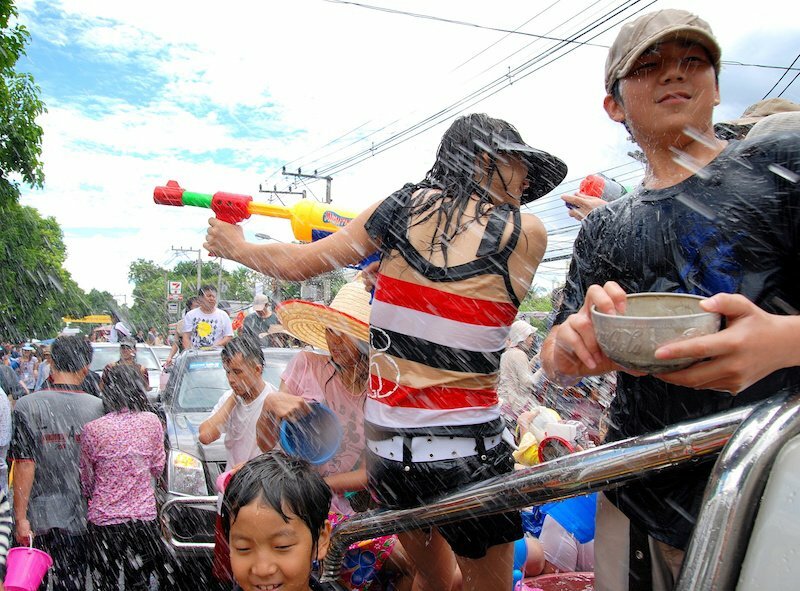 Song Kran is the Thai New Year which is celebrated on the 13th-15th April. Prepare to get soaked as locals and tourist alike will pour buckets of water over each other and shoot you with water guns. A good way to cool off in the midst of hot season. Chiang Mai has a whole bunch of exercise options, with gyms, Muay Thai schools and yoga schools proving very popular. Yoga Tree, on the west side of the moat, is the most popular school, offering different types of yoga, meditation and dance classes. Follow them on Facebook to find out about their open days and events. Wild Rose Yoga and NAMO are also very popular yoga schools. Many expats and travellers enjoy taking Muay Thai classes and some even dare to take part in fights. Find out more about Muay Thai schools and gyms is Chiang Mai here. Often there are unofficial meetups in the park where people bring their juggling equipment, slack lines, hula hoops etc. Ask around as dates change or just show up regularly and see what’s going on. You can find a list of gyms here, and many apartment buildings have their own gyms for residents. Many long-term travellers and expats in Chiang Mai like to take language classes. There is a whole range of Thai schools and courses available. Cooking courses are also very popular, with a huge choice available. Many cater to vegetarian and vegan travellers. Meeting people in Chiang Mai is really easy, and you can quickly build up a circle of good friends. Here are some meet-ups, events and Facebook groups to help you along. Chiang Mai’s nomad and expat community is very active. If you want to, you can have a busy social life every single day. Find a list of the many meet-ups here. Johnny FD organises a weekly Nomad Coffee meet-up on Fridays, which also has an active Facebook group. Chiang Mai’s Couchsurfing scene is pretty large, and they hold regular meet-ups. Join their Facebook group for updates. The Meridien Hotel in southeast Chiang Mai throws monthly pool parties, which are really popular and great fun. 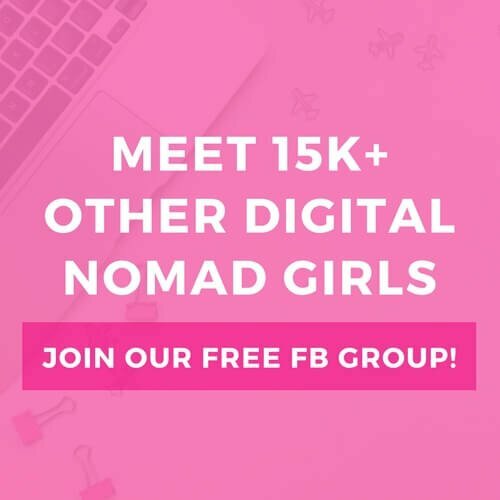 The Chiang Mai Digital Nomads Facebook group is the biggest DN Facebook group out there, with over 10,000 members to date. Founder, Dan O’Donnell, also runs a group called Bored Breaker where you can find and share events around town. There are a few groups specific to women, including the Chiang Mai Nomad Girls Group, the Chiang Mai Expat Women’s Group, and the Women’s Entrepreneur’s Group. 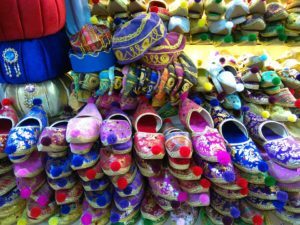 Many travel bloggers and expats call Chiang Mai their home, so there is no shortage of information about Chiang Mai available. A good starting point, especially if you’re not a frequent traveller, is 1 Stop Chiang Mai. 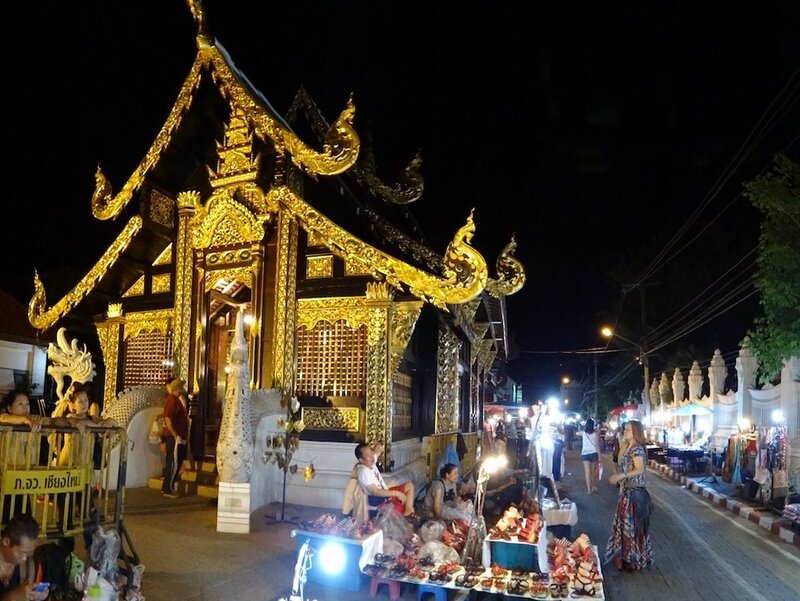 Johnny FD wrote a comprehensive guide on Chiang Mai and often writes about activities in the area. Tieland to Thailand are an American couple who left their corporate lives behind and moved to Thailand. Paperplanes is a great resource for Chiang Mai. 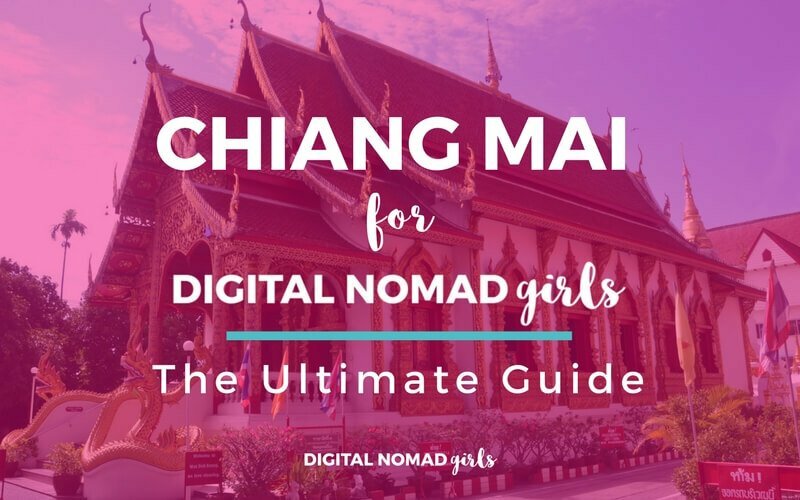 We really hope the Ultimate Chiang Mai for Digital Nomad Girls Guide will help you plan your trip and enjoy your time in Chiang Mai. We plan to update it regularly, so please leave any tips you have in the comments. If you enjoyed the guide then please feel free to share on Facebook, Twitter and Pinterest! 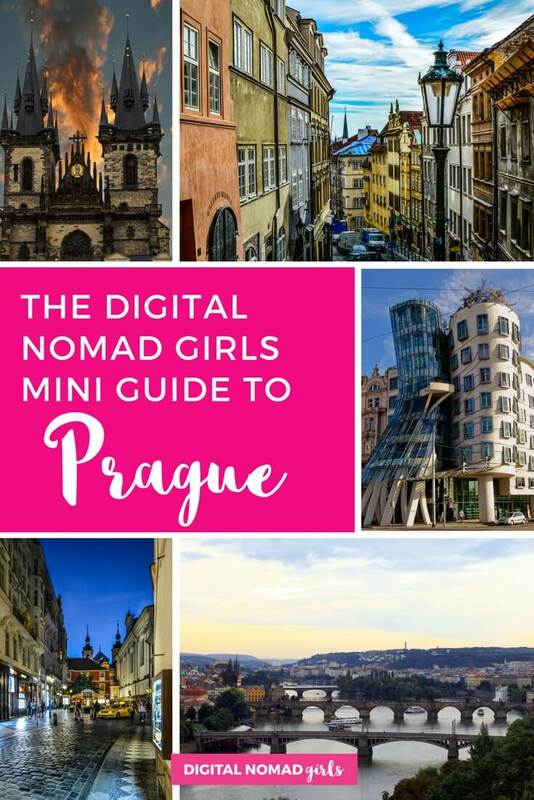 In this series, we will discover new destinations for digital nomad girls every month. We’ll feature our favourite nomad destinations as well as upcoming new hotspots. 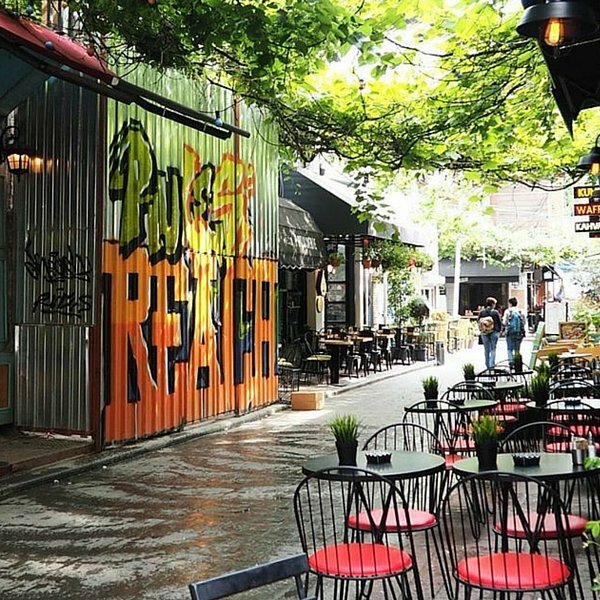 This month the lovely Fana from Istanbul Startup Girl shares her favourite places in Istanbul. 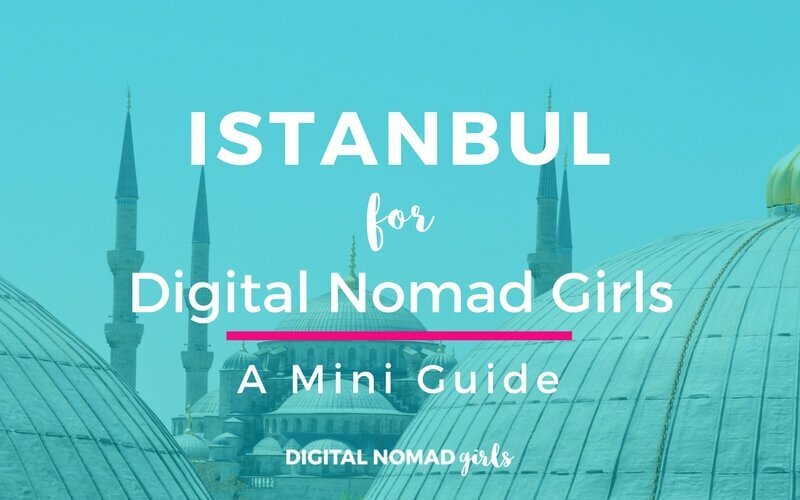 If you’re planning a trip to the Turkish capital soon you can also contact our local Digital Nomad Girl expert there. Istanbul, Turkey, the only city that sits on two continents, has been my home for 2 years. My current work involves consulting for startups and other companies in the areas of marketing and content. I originally moved here for a job, and my employer allowed me to work remotely, enabling it to be my nomadic base to travel to a number of destinations in Europe and further afield. The lira’s decline against stronger currencies means the city is even more affordable now, so it’s a great time to come visit! At time of writing, 1 dollar = 2.90 Turkish lira and 1 euro = 3.30 liras. The lira’s decline against stronger currencies means the city is even more affordable now, so it’s a great time to come visit! At time of writing, 1 dollar = 2.90 Turkish lira and 1 euro = 3.30 liras. The advantages for digital nomads include the cost of living, moderate weather, historical and architectural value, and accessibility. Few people know that Turkish Airlines is the largest carrier in the world, and the Middle East, Europe, and Asia are easily reachable from the city’s two airports. My favorite thing to do here has to be to sit anywhere with a view of the Bosporus. The perspective you enjoy here can get lost in a city as crowded and hectic as Istanbul, and the water is a great place to recharge. Things I dislike: I do wish it were easier to do business here. Dodgy practices and arbitrarily enforced laws make it difficult to be sure that your investments or deals with local companies are protected. The lack of general English knowledge is also a shock when trying to do business. Compared to the rest of Europe, decisionmaking moves at a slower speed and the cultural differences affect how negotiation is done. I hear this question a lot, and it would be silly to pretend the city is without its safety issues. A number of terror incidents in Turkey’s largest metropolis over the past few months means you should be careful, although not any more so than other large cities. Stay alert and check in with local and international news for any current problems. After living in Istanbul for a while, a spontaneous street protest seems as normal to me as the call to prayer five times a day. Street harassment is also an issue – especially for women who are visibly non-Turkish – and visitors are seen as easy targets for scams and overcharging. The tourist police can be a great help, as can being assertive in the face of any unwanted advances. General costs in the city can be kept down by staying outside the center and living like a local. Remember on nights out that alcohol is highly taxed. 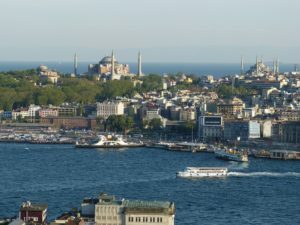 However, compared to other cities in Europe Istanbul is still on the lower end of the scale. Rent can range from 750 lira ($260) for a room in a shared flat or 1,500 lira ($520) for an entire apartment. Private flats in popular central areas are the most expensive, often being quoted in euros and dollars, and average around 3,000 liras ($1000) including utilities. Short term accommodation is plentiful but not always great quality. My area, Galata, has a number of Airbnb options. For those on a budget, I’d recommend the hostel Stay Inn Taksim. If you want to work at a coworking space, as an example Workinton charges 549 lira ($190) per month for unlimited use and 320 lira ($110) for a 40 hour package. The cost of food can vary widely, but a good average is 500-700 liras ($170-240) needed depending on how much you eat out. Transport can be approximately 100 lira ($35) a month, but if you live centrally this will be reduced. Each trip is 2.30 lira ($0.8), with reduced price transfers within 2 hours of your first trip. Free libraries Ataturk Library in Taksim and SALT Galata both have amazing architecture without the noise of most cafes in the city. If you choose to work from these, you’ll be mostly surrounded by college students, and for night owls and early risers Ataturk is open 24 hours a day. SALT Galata has the added advantage of being full of English language books you can check out when you’re not working, a rare find in Istanbul. The laid back atmosphere of bar/restaurants Journey Lounge in Cihangir and The Allis at Soho House make these my favorite for work, meetings, and drinks in the evening (sometimes all three in one day!). For a more official space, I like coworking chain Workinton’s Sishane and Galata branches, with the former offering an unbeatable view of the Golden Horn. Day passes can be had for 40 lira ($14). One thing about Turkey though, you can sit in any cafe for hours with a cup of tea and won’t be harassed – I’ve seen work sessions stretch into midnight and beyond. 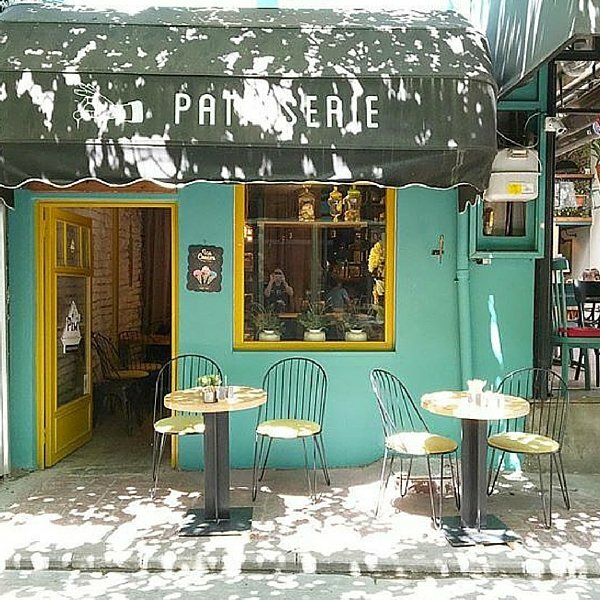 Super trendy hipster areas Karakoy and Cihangir, the pastel Ottoman wooden mansions of Arnavutkoy and the Asian side neighborhoods of Kadikoy and Caddebostan. 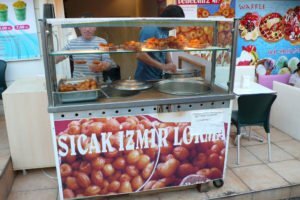 Turkey is an interesting place to be a vegetarian, and while it can be hard, some of the best street food here is vegetarian or vegan. Of course you can stick to the doner kebab Turkey is known for the world over, but why not live a little? Take çiğ köfte, a spicy vegan wrap made of bulgur and walnuts, best accompanied by the salty yogurt drink Ayran. 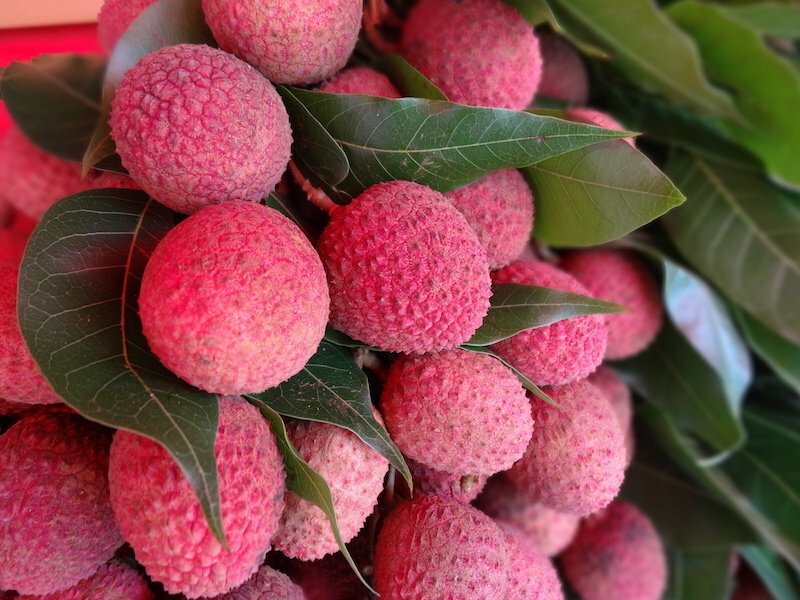 Lokma, a super sweet dessert, is another. Turkish kumpir are loaded baked potatoes as big as your head, and of course, the humble and ubiquitous borek is a good breakfast and all-day meal. My partner always jokes WiFi is the first thing I look for anywhere I go. In a pinch, find your nearest Starbucks. Most places are happy to give you their wifi code, so you’ll always be connected. If you’ll be on the go, mobile WiFi is a hassle from the local telecommunications companies, but for shorter trips, Rent N Connect may be worth a try. For transport an Istanbulkart, the reloadable transport card for the city, is worth the 10 lira ($0.35) deposit. To avoid taxi scams, download the BiTaksi app. Make friends with the street cats! I’m no expert, but from the looks of the streets and cafes there must be at least one cat or dog per person, so take advantage of that. Turkish people’s love for the street animals is exceeded only by their love for small children. Go further and spend a weekend among the fairytale, air balloon cave region of Cappadocia, or Izmir, the modern, laid back but forward looking second city of Turkey. If you’ll be staying a while, learning even a small amount of the language helps a lot, try Duolingo to start. Don’t bother with Google Translate, Tureng works much better but only does one word at a time. Visit your neighborhood’s weekly market (pazar) for fresh fruit and vegetables and a taste of local life. Fana writes about her adopted city and startups over on her blog Istanbul Startup girl. You can also find her on Twitter @iststarupgirl, on Instagram @fanreina and on Facebook. Have you been to Istanbul? What is your favourite nomad destination? Please let us know in the comments below!